A bit of context. Before Mitt Romney, those seeking the presidency operated under the laws of so-called classical politics, laws still followed by traditional campaigners like Newt Gingrich. Under these Newtonian principles, a candidate’s position on an issue tends to stay at rest until an outside force — the Tea Party, say, or a six-figure credit line at Tiffany — compels him to alter his stance, at a speed commensurate with the size of the force (usually large) and in inverse proportion to the depth of his beliefs (invariably negligible)…. But the Romney candidacy represents literally a quantum leap forward. It is governed by rules that are bizarre and appear to go against everyday experience and common sense. To be honest, even people like Mr. Fehrnstrom who are experts in Mitt Romney’s reality, or “Romneality,” seem bewildered by its implications; and any person who tells you he or she truly “understands” Mitt Romney is either lying or a corporation. Exactly so. There’s even a very helpful Feynman diagram, demonstrating that when a Mitt and an anti-Mitt collide, they annhiliate, leaving behind an electron…and a single $20 bill. Go read the whole thing to grasp — at last! — the full complexity of the quantum Romney. Probability. Mitt Romney’s political viewpoints can be expressed only in terms of likelihood, not certainty. While some views are obviously far less likely than others, no view can be thought of as absolutely impossible. Thus, for instance, there is at any given moment a nonzero chance that Mitt Romney supports child slavery. Oh. And a very happy first of April to all of you, too. 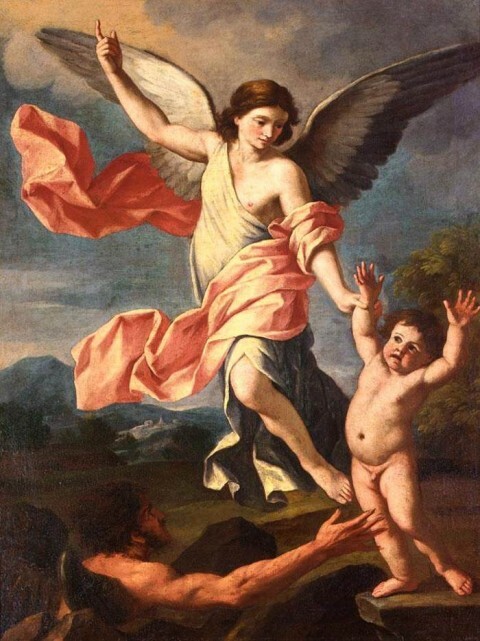 Image: Giacinto Gimignani, An Angel and a Devil Fighting for the Soul of a Child, 17 c.